Electric yacht design has come on leaps and bounds in the past few years and the latest firm to dip a toe into the waters is Van Dutch. 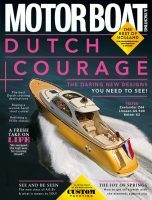 The day boat manufacturer has this week unveiled plans to build a range of electric yachts, dubbed Van Dutch E.
Based on the Van Dutch 40 (pictured above), the new electric yacht range will be developed in partnership with Aguri Technologies, a firm with experience in the Formula E electric racecar series. Still in the concept stage, there is as yet no details on how the craft will be powered, but Van Dutch is promising a 100% reduction in emissions for its new electric yacht range. Founded in 2008, the Van Dutch range includes 30-55ft vessels. Based in the Netherlands, the firm also has offices in Florida and plans to launch a 75ft model as well as the Van Dutch E electric yacht.